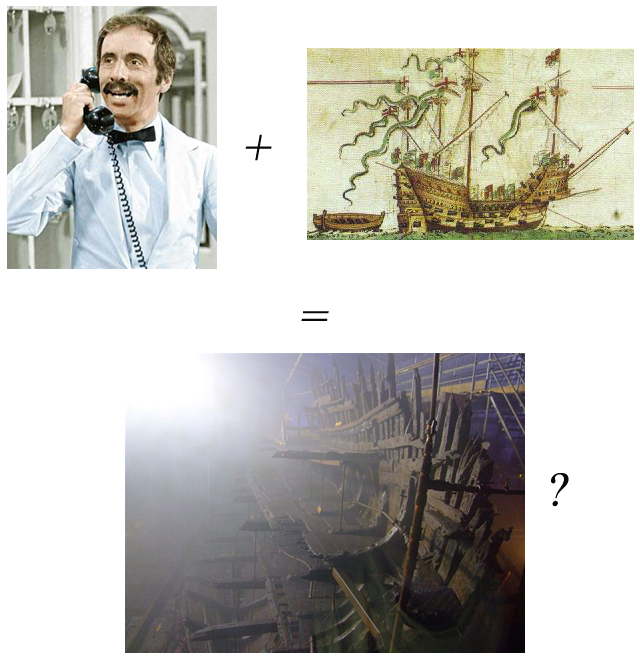 Mary Rose sunk by Johnny Foreigner after all? Another strange one, because it’s actually based (loosely!) upon some really neat science. There was a Channel 5 documentary on last night about the men that died on Henry VIIIs flagship, the Mary Rose. It, and more so the associated press coverage, featured a funky new theory about how the ship came to sink as it did. At least, the same old theory involving water-tight gun ports being left open, but with an added twist – the idea that it may have been a language barrier issue (see here for The Times’ take). That foreign sailors might not have understood the order to close the ports, assuming that it was given. This would be amusing if true, given the short shrift given to French claims to have sunk the ship themselves. Us English types I think would rather cause our own disasters than let our European cousins wreak them. Anyway, these hapless Europeans have been thrown in the mix by new research carried out by a criminologist and a medical doctor. Historians seem to be few and far between in this story, which may explain the leap that’s coming. Before I get to that, let’s give the science its credit – analysis of oxygen isotopes in the teeth of 18 of the ship’s complement shows that they did not come from the British Isles, nor even from northern Europe. Very neat, I think you’ll agree, and adds to our knowledge of this amazing archaeological find. All the more shame then that these guys want to make it sexier than it is by tying it to the most sensational aspect of the Mary Rose’s history. They suggest that because 18 men were non native English speakers, all of those responsible for the operation of the ship were likewise. In a quite stunning leap of logic, they claim that an order was given to close the gun ports, and these foreigners failed to understand it. Thus the ship was lost. Assumption 1. That the foreign men found on the ship were sailors. As the documentary says, and is well known, English monarchs made routine use of mercenary soldiers. And there were nearly as many soldiers on board the Mary Rose as mariners – 185 vs 200. Given the sample size used in this study – 18 men out of a ship’s complement of 415 (or just 4%), the mystery “strangers” (as the Tudors would have called them) are just as likely to have been fighting men as they are seamen. When you factor in the historical record, which shows very few foreign mariners (navigation specialists and officers, mainly) in the employ of the Tudor navy, but a hell of a lot of mercenary soldiers of all nations, it’s actually more likely that the soldiers are our guys. The proponents of this theory acknowledge as much, but fail to recognise that as soldiers, they would not have been subject to any order given to close gun ports, whether or not they understood it! They are, in my opinion, a total red herring as far as the sinking “mystery” goes. Assumption 2. That Not English = Don’t do English. Assume for a moment that the 18 were seamen rather than soldiers. We’re talking (in either case actually) about well-travelled men of the world who had to make themselves understood wherever they may go. They would do this through picking up something of the various languages they might encounter, and by good old fashioned gesturing. Surely the Spanish (or whatever) for “window” must have been known to some of the English-speaking crewmembers. Are we to assume that the Spaniards (or whoever) lacked even a tourist’s understanding of English? Why? I’m sorry, but personal incredulity does not equal an earth-shattering discovery. Why has no-one spoken to a medieval or other historian for some context and perspective here? Instead the writer of that article approaches a museum director who is equally amazed that 16th century Europeans travelled and fought for countries other than their own. Mercenaries had to be transported somehow, and they would be a valuable defensive asset whilst on board (pre the Royal Marines). Even if we agree that we’re talking here about sailors, the assertion that multiple languages (and who says there was more than one anyway?!) would have been “a recipe for disaster” is ridiculous. Generations of seamen would disagree with her. Mixed crews were common, most famously on pirate ships, but also in state navies. How did these ships function? How did the 18 different nationalities represented on HMS Victory centuries later (by which time the proportion of foreign seamen was restricted by law) communicate successfully? If we’re going to infer anything from this scenario, it actually seems to me that if the King’s flagship had many apparently trusted foreign sailors on board, other ships in the fleet are also likely to have. If there were problems as a result of this, where is the historical evidence? Where are the incidents of incompetence? The recommendations and laws passed to remedy it? ..letters written by King Henry VIII were uncovered at the British Library in London, written six months before the ship went down, in which he says he’d hired 600 Spanish mariners for his navy. …and that this confirmed the above findings. Firstly, it’s not at all new. Secondly, it’s not at all accurate. These men were not mariners but mercenary soldiers (harquebusiers). They had been sent home with minimal pay as surplus to requirements, so when they laid over at Falmouth, Henry had them pressed into service. They were immediately sent to the Scottish borders, making it less likely that these could be the specific individuals found on the Mary Rose. But Henry’s papers alone show many hundreds of Spanish mercenaries and other nationalities besides, so I’m not sure why those men in particular should be seized upon as evidence. This is offered as proof that there were indeed non-English speakers onboard. The problem is that it doesn’t say anything of the sort. Seamen were all “knaves” by anyone’s definition at that time, and you might even find crews of convicted criminals employed. Discipline was non-existent, meaning that captains often had to rule by brute force. Carew is simply saying that the crew was impossible to control. If he’d had trouble with foreigners, he’d have had no compunction over saying so – it would have been an even better excuse for losing the ship. And again, even if this did refer to foreigners, it doesn’t mean that they couldn’t understand orders, nor specifically any order to close ports. The argument is circular. Assumption 4. That no interpreter would have been employed. Again granting a scenario where the majority didn’t understand English, the obvious and elegant way to the verbal communication of information and orders (see below re “action” orders) is to have an interpreter on board. Be he informally selected from either group, or brought in professionally before departure, it’s inconceivable that a captain (overseen by an Admiral in this case) would take out a ship where the simplest of orders could not be understood, all for want of someone with the equivalent of GCSE Spanish (a lingua franca even then). And this is exactly what was done on the Galley “Subtylle” in 1546 when a Spanish captain was employed on a ship full of Englishmen. Assumption 5. That verbal communication is even relevant to this scenario. This one renders the others redundant. On a ships firing deck in battle, with men, equipment and the ship itself all moving noisily around, and with cannon going off at regular intervals, orders were transmitted by bosun’s call or whistle, not by shouting. Ironically, one of the featured skeletons in the documentary and the articles was found with a bosun’s call next to him, yet still we have this ridiculous theory of dozy shrugging “Dagos” bringing down the King’s finest vessel. The programme even states that the order to open and close gun ports would have been delivered by a man like this, with a whistle like this. Where does language or nationality come into it? Assumption 6. That closing the gun ports would even have been achievable. The old theory goes that the ship went down in a hard turn, as water began to flood into the gun ports. This is based upon ports found to be open on the wreck, plus the short distance to the waterline. This new add-on theory suggests that after this turn was commanded, the ports should have been closed. This would have been very difficult to do in the time available. Was the order even given? Should it have been? Would the ship’s crew really have been required to close the ports for each and every turn? Or, was the turn executed too steeply in the first place, as the original theory suggested? All of this makes the hypothesis as presented in the media a totally unsupported assertion, built on an already uncertain inference about the gun ports. The osteoarchaeological evidence for Mediterranean seaman being on the Mary Rose is very cool. But to take it further than that is pure speculation. I’m always suspicious of media coaching of unwary academics, so I await the upcoming article with interest and as open a mind as I can manage given the bare facts of the case. Quite different emphasis there. The first version from the article, though it still does not support the idea of a foreign crew, does have the right emphasis – it’s saying “I have the kind of crew I can’t control”. This can be twisted to mean that said crew couldn’t understand orders. But the more accurate quote is saying something more akin to “my crew are a bunch of scumbags. I can’t control them”. “Sort”, if you pay attention to the “a” and the comma, doesn’t mean “type”. I read it as meaning “assortment” or “group”. And the summary of the conclusions, though more tentative than the TV programme and media coverage, still states that the hypothesis is of a ship’s crew who failed to understand the order to close gun ports because they were foreign. Which is nonsense for the reasons I’ve already outlined. Once again, the biggest flaw here is that any foreigners amongst the ship’s complement are likely to have been mercenaries. The abstract gives this as one possibility, but fails to recognise that mercenary sailors were not employed by the Henry VIII – but mercenary soldiers certainly were (including the 600 men that were proposed in the documentary). As I pointed out previously, 200 of the ship’s complement are KNOWN to have been soldiers. These are your Europeans, these are your mercenaries. And they would have had nada to do with the running of the ship. I see that the Mary Rose Trust are thanked in the article – why haven’t they pointed out the obvious flaws in this thesis? Update, November 2008 – I’m still not convinced.